Zara hangs from window grill. Ruksaar takes curtain rod and tries to push Zara down. Ayesha comes near hospital and sees Zara hanging, she screams for her. Kabir is running to hospital recalling Zara’s words. Ayesha comes to window and tries to pull Zara up. Kabir comes there and sees Zara hanging. He runs to her ward. Zara says save me. Kabir comes to window and asks Zara to give hand to him. Ayesha is crying. Zara calls for him. Kabir throws curtain to her. Zara grabs it. Kabir tries to pull her up. He uses his full force and pull her up but all his money falls down. Ayesha takes Ruksaar from there. Kabir pulls Zara in room. He sighs and hugs her. He checks her and asks if she is fine? Zara says I am fine. Zara kisses his forehead and says I am fine. He keeps kissing her hands and says I was coming to show you my earned money but they fell down when I was saving you. Zara looks away. Kabir says I wont stop, I will earn, I will earn daily. Zara shows him one note that she saved, she says this is your earning, I got it, this 100 rs is more important to me than anything else. Kabir hugs her, Tai hai plays. Kabir brings Zara out of room and asks how did you slip? Ruksaaar was with you? Zara looks on and nods. Kabir asks what happened? Kabir sees some people outside Zara’s ward. They come inside to see Ayesha slapping Ruksaar and asking her why she pushed Zara? Ayesha rushes to Zara. Zeenat comes there and asks Zara if she is fine? Ruksaar is crying. Ayesha says thank God Kabir saved her, Ruksaar killed you today. She hugs her and cries. Zeenat is tensed. Kabir eyes Ruksaar. He thanks guards and ask them to leave, all leave. Kabir says to Ruksaar that dont be scared, I am your friend, just tell me why you pushed her? Ruksaar cries and says I had to take revenge from Zara, she pushed me to coma so I wanted to take revenge for that. Ayesha pulls Zara aside. Kabir says no worries, he gives her water, Kabir asks what is coma? Zeenat thinks that I didnt tell her about coma, he can make her tell truth. Ruksaar says I dont remember it. Kabir says Zara put you in coma? who told you this? Ruksaar recalls how Zeenat said it and looks at her. She says nobody told me. Kabir says remember the story that a girl never used to lie and God liked her a lot, God doesnt like people who lie. Kabir says you know what happens if you lie, you go to hell, tell me who told that Zara put you in coma? Ruksaar eyes Zeenat and recalls how Zeenat told that if you take my name then I will throw scorpios at you. Ruksaar gets scared and says no I wont tell. Kabir says you have a child’s mind so someone must have told you to do this. Ruksaar says no. Kabir shouts at her and says tell me who did this. Ayesha asks her to tell who did it? They hear police siren. Kabir says Ruksaar police is here, if you dont tell truth then they will question you. She shakes her hand. Zeenat says she is a kid, dont do this. Kabir says someone tried to kill my wife and we have to find truth. He pulls Ruksaar and takes her from there. Zara goes behind him. Inspector meets family. He asks Zara how you fell? Zara says I was looking at a butterfly, I was trying to catch it and I lost my balance and fell. Inspector says so nobody threw you down? Zara thinks I am lying to save Ruksaar. She nods. Ayesha says no I saw Ruksaar throwing pots at her. Zara says no she was trying to save me. Kabir says Zara knew all truth, you came later mom. Zara says Ruksaar was trying to save me. Kabir says it was an accident. Police leaves. Ayesha asks what is all this? Kabir asks Ayesha to take Zeenat and go home. Zeenat says lets go. She looks at Ruksaar, Kabir notices it. Zeenat leaves. Kabir says to Zara that Ruksaar wont live in house, she pushed you today and can do anything. Zara says thank God you didnt say anything to police, she is ill. Kabir says if I didnt save Ruksaar then I wont find who is behind all this. Zara says we have to ask father first. 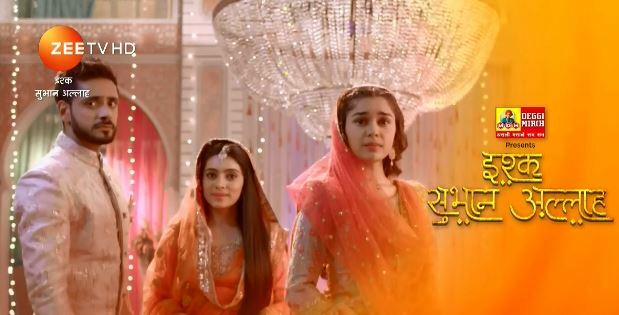 Kabir says Ruksaar is in my nikah, I will do what is right for her. PRECAP- Kabir asks Ruksaar where you want to live? with us or jail? Ruksaar says with you, dont let Zeenat come near me, she is bad. Kabir looks on.